Please join Buncombe County women attorneys in a fundraising kickoff at Rustic Grape on May 1 from 5:30 – 7:00 pm to support Asheville Area Habitat for Humanity’s Women Build project. The Women Build house is an affordable, safe, and energy efficient home that a local member of our community will purchase. Affordable housing helps our neighbors build their economic security and creates a stable foundation to raise their family on. We’re raising $10,000 to help support this construction by women in our area. Please join us for a fun evening and learn more about this project! Please join us as we celebrate one of our very own Western North Carolina women attorneys, Jacqueline Grant, for her accomplishment in serving as the President of the North Carolina Bar Association. Luncheon to be held at Pack’s Tavern, 20 S. Spruce St., Asheville, NC 28801, on February 20th, at 12:30 p.m. Please RSVP to Rhodes@gtalaw.net. 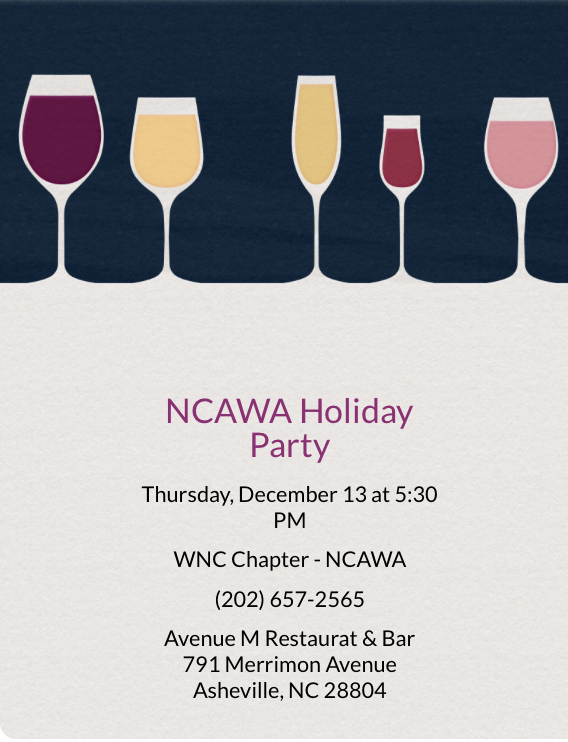 Please join us for our annual Holiday Party, December 13th, at 5:30 at Ave. M Restaurant & Bar. There will be heavy hors d’oeuvres, wine and great company! We hope to see you there! The WNC Chapter of the NCAWA invites the 28th Judicial Bar to our annual New Admittee Luncheon where we will welcome our new admittees to the North Carolina bar by treating them to lunch at our October meeting. The luncheon will be held on October 17th at Pack’s Tavern at 20 S. Spruce St., Asheville, NC at 12:30p.m. We look forward to seeing new faces in October!